4 lbs of the best quality salmon in the world. 2 lbs Wild Alaska King Salmon and 2 lbs Wild Alaska Sockeye Salmon. SKU: AFS0007. Categories: GIFT PACKS, Salmon. Tags: king salmon, Sockeye salmon. 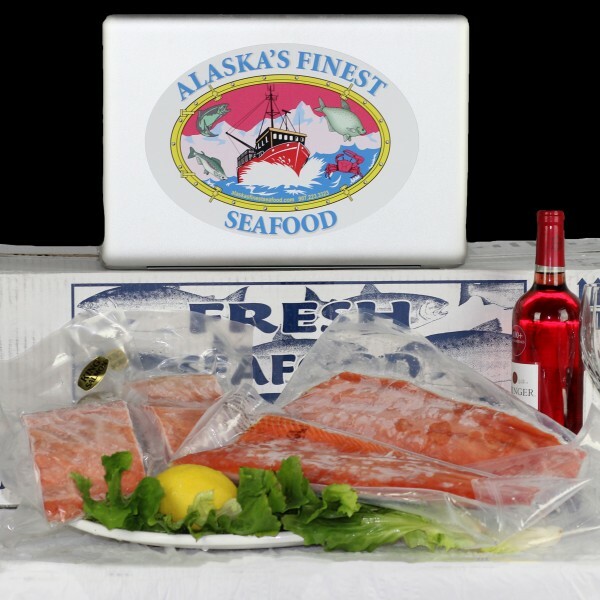 This Sockeye and King Salmon Combo makes a fabulous Gift Package. Wild caught Alaska King Salmon and Alaska wild caught Sockeye. You'll be enjoying 2 pounds of each. This combination will really be a family or party hit. Our salmon is perfectly filleted skin on boneless and shipped FedEx or UPS to your door over night! You can't get it any fresher. When in season we ship this salmon fresh overnight! We also fillet this salmon, vacuum pack and ship frozen. Check our fresh section of the website for fresh catch! Both of these wild caught prodcuts are rich in Omega-3. See our nutrition section for more information. With so much focus on the amazing omega-3 benefits of salmon, other unique health benefits from salmon may have been inadvertently overlooked. One fascinating new area of health benefits involves the protein and amino acid content of salmon. Several recent studies have found that salmon contains small bioactive protein molecules (called bioactive peptides) that may provide special support for joint cartilage, insulin effectiveness, and control of inflammation in the digestive tract. One particular bioactive peptide called calcitonin (sCT) has been of special interest in these studies. The reason is because a human form of calcitonin is made by the thyroid gland, and we know that it is a key hormone for helping regulate and stabilize the balance of collagen and minerals in the bone and surrounding tissue. As researchers learn more and more about salmon peptides—including sCT—we expect to see more and more potential health benefits discovered related to inflammation, including inflammation of the joints. Even though contamination with mercury, pesticides, and persistent organic pollutants (POPS) has become a widespread problem in salmon habitats and with the quality of salmon itself, there are still salmon runs that pose relatively low risk in terms of contaminants. Leading this low-risk category for wild-caught salmon are Alaskan salmon. Southeast Alaskan chum, sockeye, coho, pink, and chinook salmon, together with Kodiak coho, pink, and chum salmon have all been evaluated for contaminant consumption risk involving many POPs (including dioxins, dioxin-like compounds, or DLCs, and polychlorinated biphenyls, or PCBs) and have been found to be the lowest risk category of wild-caught salmon for regular consumption. This lower contamination risk amongst all wild-caught salmon is one of the reasons we recommend selection of wild-caught Alaskan salmon as a salmon of choice.